The South Side Communication Center is much more than a safe place for middle school and high school students to gather after the school day ends. The center, opened in January 2011 through a partnership with the Southside Community Coalition, Syracuse University’s South Side Initiative Office and Home HeadQuarters, offers computer access, tutoring support, mentoring and positive reinforcement. The South Side Communication Center is administered by Dean Bea González at University College. Students gather at the Southside Communication Center after the school day ends to work on various skills. “They call me Mom,” she says. Scrivens says that she teaches the students that they don’t have to be victims of their circumstances. “They only hear what they can’t do. They need to hear that they can succeed in life. We are here to support and encourage them. We look at the individual student and determine what their barriers are. We act as a liaison between students and teachers, or parents and students, to make sure they are getting what they need. We want them to know that there is someone in their life that cares about them,” she says. The students have taken cooking classes, learned cursive writing and how to play chess. They also participate in the “Economy Game of Life” which teaches them about practical life skills they will need in the future. “They investigate job options, whether or not they will go to college or trade school and how they will pay for it,” explains Scrivens. They are taught how to look for a job, fill out a resume, act appropriately at a job interview and how to pay taxes. The students get a “paycheck” for coming to the center. “We have them look up the salary of different jobs and how they would pay their bills on the income of that job. Can they afford to buy a house? A car? Do they have enough money to get their nails done? They are surprised at the outcome and have more understanding of the choices their parents make,” says Scrivens. GED and job preparation, ESL services, drug prevention and leadership training are just a few of the programs that take place at the center as a result of the newly opened satellite location of Liberty Partnership Program (LPP) run through SU’s School of Education. The program served 279 students in grades 6-12 last year. Students in the LPP program had a 91.8 percent graduation rate. During the school year, academic programs take precedence, but in the summer, the staff can focus on enrichment programs such as self-esteem, poetry, team building and outdoor recreation. One of the summer programs offered at the center was learning how to sew. 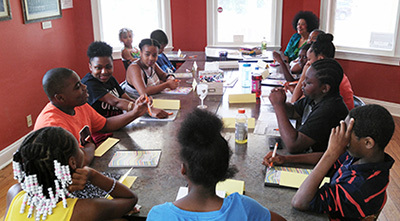 Young men and women from middle school through high school gathered each week to learn the basics. The first instructor quit after two weeks, but Scrivens was very fortunate to have SU student Maisa Young come to her door to drop off donations. “When I told her our sewing instructor quit, she offered to teach the students herself and she’s been here ever since,” says Scrivens. The students learned more than the mechanics of sewing. They learned patience and perseverance that resulted in a feeling of accomplishment. “They thought they couldn’t do it. They couldn’t thread a needle and didn’t know how to run the machine. At the end, the majority of them successfully completed their project,” says Scrivens. Ronnaeyshia Goodwin, an 11th grade student at Nottingham High School, was anxious to try her hand at sewing. After watching “Project Runway” on television, she wanted to learn to make her own clothes. “My aunt makes her own clothes and I wanted to learn the process. When I completed the skirt, I knew it was something I could do,” she says. As a result of making a complete outfit, Goodwin was the winner of the sewing contest and received a new sewing machine. Now she’s making hair bows and bow ties for her friends. “I sew a lot now. My brother always comes to me to make his clothes into something different. I take clothes out of my closet and make them into something else as well.” Goodwin’s goal is to obtain a business license and open her own shop—a combination of cosmetology services and fashion design.